Hokkaido is the northernmost island of Japan, an archipelago that stretches a long distance from north to south. The island is at roughly the same latitudes as Chicago, London and Munich. New Chitose Airport, the gateway to Hokkaido, o ers direct ﬂights to many destinations in Asia and Europe. People in Hokkaido enjoy various outdoor activities in each of the four seasons. Foreign nationals have been visiting Hokkaido in increasing numbers to appreciate the natural environment and the safe local food. Hokkaido has a population of 5.4 million, and 1.95 million of these people live in Sapporo. 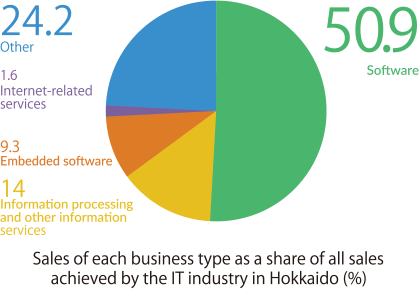 The IT industry is among the key industries of Sapporo. Because Sapporo Valley has a strong brand and has earned the trust of many businesses, these IT companies have grown to achieve annual gross sales of 400 billion yen and to employ a total of 20,000 people. 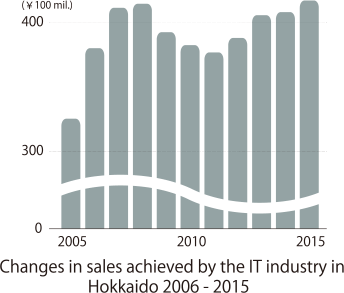 The members of the Hokkaido Information and Communication Technology Association (HICTA) are aware of how much the IT industry contributes to Hokkaido's economy, and they take pride in that contribution. 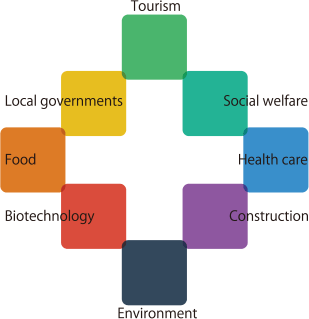 HICTA’s mission is to proactively create systems and projects so that HICTA members can ﬂexibly respond to changes in the social environment. HICTA also increases the collective strengths of IT companies by enhancing cooperation and networking among HICTA members and local businesses. In the age of IoT that we now face, many things, including devices and systems, are interconnected by the Internet. A broad range of industries, including agriculture, tourism and manufacturing, have entered a new stage of e orts that these industries need to make in order to capitalize on information technologies. At this time of signiﬁcant change, a time that has been referred to as "the fourth industrial revolution," HICTA must fulﬁll its mission of achieving continued industrial development by exchanging ideas with local businesses. HICTA is determined to keep making e orts to support local industries through the best possible combination of human wisdom and IT. As an opinion leader in the promotion of IT in Hokkaido, HICTA aims at increasing the technological level of IT companies in Hokkaido as well as at enhancing their creative capabilities and ability to disseminate information. For this purpose, HICTA is deepening its ties with di erent types of businesses, thereby helping to promote informatization in the local community, industry and government services, and is cooperating with organizations related to the information industry which operate at home and overseas. HICTA holds seminars that focus on information technologies and business trends, and provides various programs aimed to enhance exchanges among those companies. Programs whereby member companies can secure desirable human resources are also o ered, as recruitment is a big challenge in business these days. HICTA is also contributing to the popularization of personal information protection and the development of safe local communities. HICTA has been supporting the progress of globalization by promoting cooperation with overseas companies. Focusing on o shore development, HICTA o ers information about IT to Asian countries such as Vietnam and China. Additionally, HICTA helps various companies to recruit highly skilled engineers and specialists overseas, and supports IT companies in Hokkaido that wish to cooperate with overseas companies on the collaborative development and marketing of products and services.